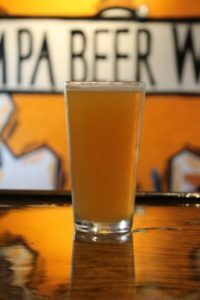 Saint Bosco India Pale Ale was originally brewed for the Don Bosco festival at Mary Help of Christians Center in Tampa, FL. This craft beer was developed to accommodate a wide range of palettes, but also keep true to our love of hops. Saint Bosco’s light body, smooth finish, and citrus hops make it an easy drinking favorite. SRM: 5 A juicy New England Style IPA with subtle notes of grapefruit and apricot. Light bitter flavors and body to accent the noble hops to create the backbone of this beer. Triple dry-hopped with Citra hops for it’s juicy finish and haze.